Through training partners, we are able to fulfill whatever training needs our customers require, from individual instruction, to staff training on and off site. Product training enables members to confront changing technologies and technical terms. Learn about problems and their solutions, both in general as well as the nitty-gritty details. Classes present new and fresh information for both experienced and new users. Learn about the experiences of your colleagues through discussions with other participants. Opportunity to ask specific questions to an instructor that is knowledgeable. To discuss your training needs or request a specialized training proposal, contact us. Three days of intensive hands-on training in the use of a video camcorder to document all forms of criminal activity. An afternoon and evening session on the second day ensures participants will know how to use their camcorders in low light conditions and with night scopes. The evening session will also allow participants to use light to film crime scenes and search warrants after dark. Team Guardian LLC, is a private investigation, training, and consulting company based in Phoenix, Arizona. Team Guardian provides general investigation services and are specialists in covert physical and technical surveillance. Private investigations include domestic cases (divorce, child custody), personal injury insurance claims, lifestyle checks, and corporate theft and fraud cases. Team Guardian training programs and consulting addresses safety and security issues in the public and private sector. This book explains how to take surreptitious photographs and record video of people and property in a safe and effective manner while producing excellent results. 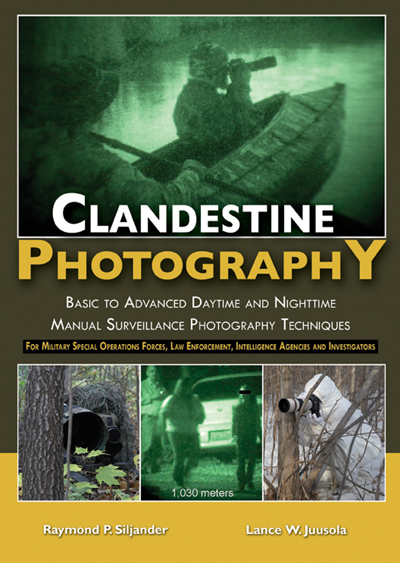 It is the most comprehensive text on clandestine photography available. It takes the reader through conventional as well as the most sophisticated clandestine photography methods in practice today, and it covers the use of all types of equipment ranging from off-the-shelf to the most high-tech equipment available. The ultra-long-range night vision photography methods discussed in this book were devised by the authors and only exist here. Readers will discover esoteric techniques for photographically recording recognizable human and vehicle plate images from distances of over a mile in both daylight and night conditions. Myriad methods for secretly photographing people and property under diverse and difficult conditions are presented. Readers will discover innovative applications of combinations of old and new photographic-related technologies—some combined in unexpected ways that produce surprising results. It is written and extremely well illustrated in an easy to understand style for all photographers regardless of skill level. The book is appropriate for anyone in law enforcement, military operations, and private investigation. It will also benefit government surveillance specialists and those responsible for detecting and thwarting manual clandestine photography. 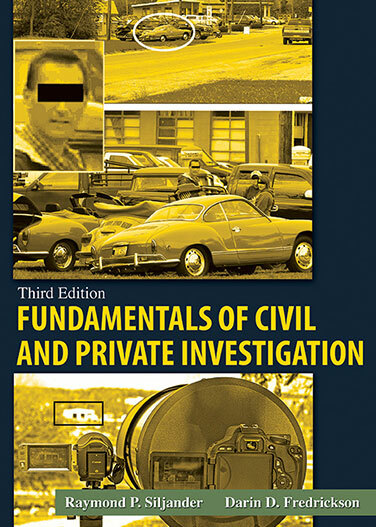 Since the first and second editions of this book, there have been extensive changes in the private investigative sector. The Internet and technological advances have revolutionized how investigators work cases. Today, private investigators have computer access to diverse sources of information, and communication and photographic technologies have reached levels inconceivable not many years ago. This third edition guides the reader through these new and essential investigative techniques. From the beginning, the authors explain the various needs of the investigator and then show how to apply those abilities. These include problem solving, understanding people, identifying differences, applying laws, understanding and implementing successful interviewing techniques, and identifying exception rules. Also discussed are such areas as report writing, interrogations, locating missing persons, industrial and commercial undercover operations, accident investigations, business and industrial espionage, and legal constraints. Expanded and greatly updated chapters on information technology, modern equipment and methods, optical-related visual aids, VIP protection, and managing a detective agency are provided. In addition, the text is generously illustrated with photos, diagrams, and document examples. This new edition has been prepared with the greatest attention to both textual quality and production details. The book will serve well as both a learning tool and a source of reference. The primary target populations of this book are individuals who desire to become a private investigator, individuals new to the profession, and those who desire to broaden their professional knowledge. Others who will benefit from the information the book provides include insurance professionals, attorneys and paralegals, police officers and other government investigators, and law and criminal justice students.